Nik is clearly a knowledgeable man in his field with a lot of integrity and commitment to offering a safe and professional service. The service was clean and our house was left as he found it. 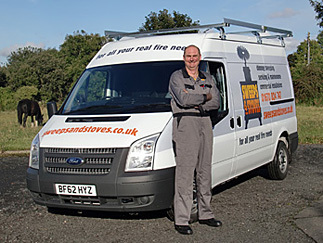 Sweeps and Stoves are a Northumberland based service that can take care of all of your chimney sweeping and stove care needs. We cover Northumberland, Tyne & Wear, and parts of County Durham including both rural and urban areas. We are members of the National Association of Chimney Sweeps and HETAS, the official body for solid fuel domestic heating appliances, fuels and services. Sweeps and Stoves was set up because of our own love of and passion for real fires and stoves. Our knowledge built up over years, backed up with our training and professional qualifications means that we can offer you the best possible service. We will ensure that all of your needs relating to the maintenance, upkeep and repair of your chimneys, flues and solid fuel appliances are met professionally, safety and with outstanding customer care. We have undertaken rigorous professional training and are qualified and insured to undertake all of the work that we do. We will never agree to carry out work that we are not qualified to do. We offer a highly competitive rate for our services charging a fair and honest rate for our work – with plenty of free advice too! We will undertake the work that you have asked us to do, at an agreed time and an agreed price – no waiting in for tradesmen who do not show up. We treat our customers and their homes with the same respect as we expect ourselves. We are friendly and courteous at all times and take excellent care of your home and furnishings whilst we carry out our work.